I almost considered calling this cheesecake “My Favorite Cheesecake!!! Seriously, THE Best Cheesecake I Had in a Long Time” Right…I know, it’s super silly. And it may even seem as if I’m exaggerating. But truly, this is the best cheesecake for me! Please don’t tell my mom I’m saying this! She is the cheesecake QUEEN and that is why I never make a cheesecake. She takes her time. She actually takes a few days to create her pièce de résistance. She gets requests for her cheesecake for holiday parties and birthday parties alike. Quite frankly, I’m not sure why she’s not selling them! Scroll down to find an amazing list of recipes by wonderful bloggers celebrating National Cheesecake Day. A BIG thanks to Roxana of Roxana’s Home Baking for putting together this delicious event. So you see, the pressure is on when I think of baking a cheesecake, because it has to be as good as hers or I may as well not even attempt one! The truth is, my family is totally satisfied when I make this no-bake version. My husband declared it, “So light and really good!”. My son told me I make the best cheesecakes ever, as he was digging into the pan with a spoon!! Yikes! You know what that means, it’s time to make anther one! It’s not completely no-bake. 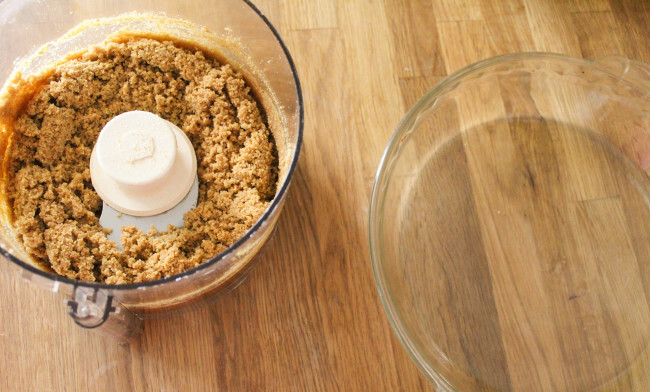 I did make my own graham cracker crust and baked it for about 8 minutes (just to firm it all up). Be sure to completely cool the crust down before you add the filling. You could go ahead and use a ready-made crust…but really, why would you? It’s SO easy to make your own crust and trust me, the flavor blows away the ready-made kind. I use olive-oil in my recipe to make it a little healthier. If you prefer butter, go ahead and use that instead! I recommend letting this chill for at least an hour before slicing. A warning: it will be very hard to wait that long! If you don’t wait that long, it will be almost like pudding texture when you slice. If you do not have limoncello available, you could substitute fresh lemon juice. crust cool in fridge while you make the filling. Beat together the cream cheese, sugar, vanilla and limoncello (or lemon juice) in a bowl until smooth; set aside. 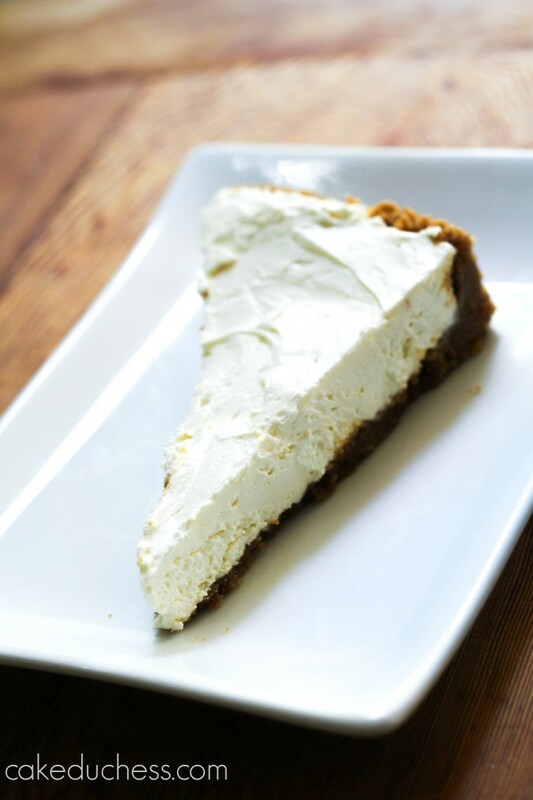 No bake cheesecake is one of my favorites to make, specially during the hot summer days. No need to stop indulging in good desserts. You did not! A limoncello cheesecake?! Dying! 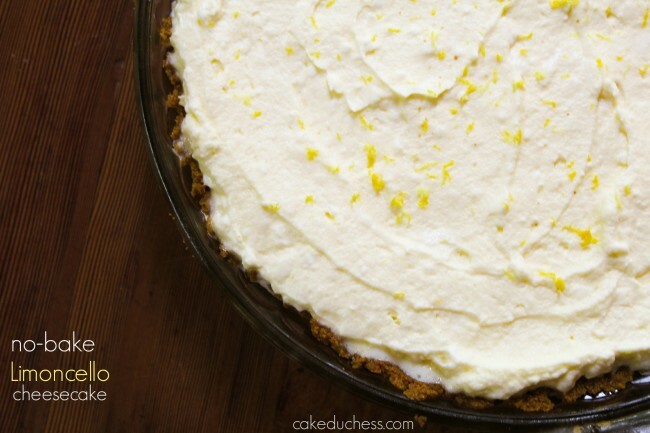 Love your no bake lemony recipe! A nod of approval from family members is gold in my book. Lovely, lovely cheesecake, Lora! I have made lemon cheesecake before but love your Italian twist on this cheesecake by adding limoncello! Beautiful Lora! This is heaven, just pure heaven. Love the limoncello twist on this simple cheesecake! Also, thank you for sharing all of those other delicious cheesecake recipe from other bloggers! We love limoncello – and what a perfect addition to a delicious cheesecake! Could this be any more perfect?! Love it so much! This sounds just too good to be true. I absolutely adore citrus desserts, especially cheesecake! I adore limoncello and Italy! Ha! The collection and links to recipes is amazing! I go weak over citrus desserts! That its no bake puts it over the top for me. No, wait. It's the limoncello… No… It's everything!! I love citrus in desserts. and I love cheesecake so bring this baby on! Oh yeah! You had me at no bake, and then you sealed the deal with the Limoncello! Absolutely GENIUS! I love this! One should ALWAYS have limoncello at home, don't you think? Lora, this is beautiful. I love that you use olive oil in your crust and that filling does indeed look light, airy and creamy. Beautiful job, my friend! This looks fabulous! I've never put olive oil in a pie crust before. Limoncello and no bake! Excellent! Love your lemony cheesecake. Adding it to my must try no-bake to-do list! It was a please meeting you in person at the Food and Wine Conference!!! There's definitely room in this world for both the slow baked cheesecakes and the lighter no bake…especially when they're flavored with limoncello! It sounds incredible, Lora! YUM! 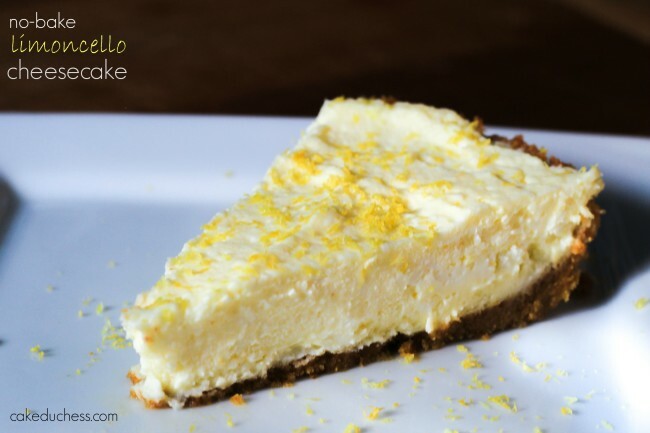 Limoncello is SO delicious, and such a perfect addition to cheesecake! That is one beautiful cheesecake! I love that it looks so light! The limoncello sealed the deal for me – love that!! No-bake is my favorite in the summer! Plus I love me some limoncello. Shut. Up. This looks awesome! I love limoncello and would adore it in this cheesecake, it is lovely to see you again too!!! Hi Lora!! how did I not comment on this one?! I'm back from vacation and trying to get caught up!!! loved this cheesecake!! Anything with limoncello is winning in my book! This sounds like a wonderful combo! I have a local distillery that makes a great limoncello! 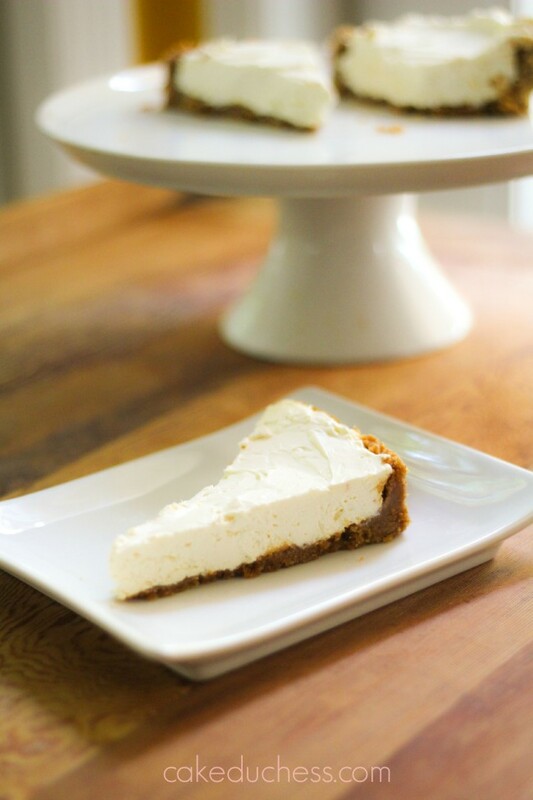 This is the second no-bake cheesecake I have fallen head over heels for just looking at it today. I need to get on this no-bake cheesecake train. I just love limoncello! What a great idea to make a cheesecake from it! PINNED!